Summary: In this conversation interview included in Gyakuten Saiban Fanbook, we have Takumi Shū, creator of the Gyakuten Saiban (Ace Attorney) games talking with mystery writer Arisugawa Alice (a male). The two talk about mystery fiction, and about each other works. Takumi reveals that he has also drawn inspiration for his stories from Arisugawa's works, while Arisugawa explains why he thinks fans of mystery fiction will enjoy Takumi's games. The two also discuss the (non-?) importance of characters backgrounds, as well as how each of them write their mystery stories in the first place. Interviewer: Allow me to pose this question to Mr. Arisugawa first. What do you think about Gyakuten Saiban, having played it? Arisugawa: I had been looking for forward to it, as I knew it was a game where I’d need to solve a mystery and go to battle in the courtroom, but it was even better as a mystery than I had expected. And what really came as a surprise was how funny the game was. Before I played the game, I had already picked up that I was supposed to be a very amusing game, but I thought that it was a serious game where you’d need to use your brains. Nobody had told me the characters were so unique or that you would laugh that much, so I was really pleasantly surprised. I never could’ve guessed the characters would be so nonsensical unique (laugh). Takumi: I am really glad you played the game. Everyone is still tame in the first game though. Arisugawa: But in the fourth episode of the first game, there’s that cross-examination scene that had my cry out: “I have that cross-examine that!?”. I cried out and laughed. And the prosecutors were also all memorable. I just have to think of them to start laughing. I went to the dentist last time, but I started to think back to the game and couldn’t control myself. Normally I’d be all nervous, and it’s pretty bad to laugh while getting treated (laugh). Interviewer: Mr. Takumi, were you influenced by any works when you worked on Gyakuten Saiban? Takumi: I’d say Edogawa Rampo’s The Psychological Test. Everything gets turned around by just one single word at the end of the story. I love that ending, and I wanted to create something like that myself. I won’t copy whole episodes from existing works as a rule, but actually, I did use some of Mr. Arisugawa’s works as a hint for the games. Takumi: I used about two of them. One of them is from Sōtō no Akuma (“The Double-Headed Devil”). That’s a story where incidents happen at two different places which have been cut off from each other. I had been thinking about using that for the final episode in the next game while I was working on Gyakuten Saiban 2 (Ace Attorney 2 - Justice For All). But I don’t think that went really well (laugh). Well, there were incidents happening in places that had been cut off. At least I like to think I did accomplish that.. Another was episode 3 from the second game. I had the trick from 46 Banme no Misshitsu (“The 46th Locked Room”) in my head, and I mixed it with Ōsaka Keikichi’s The Hangman of the Department Store. Arisugawa: You don’t say. Both the story and the setting of Gyakuten Saiban are really unique. The protagonist isn’t facing problems like “What was the murder weapon of these serial killings” or “Who is the murderer?”. The fact the game takes on the form of a courtroom drama, with the protagonist forced to detect himself to win at the trial is what makes this game so original. Usually, the courtroom scenes are abbreviated in mystery novels. “You’re the killer” will be shouted, but the procedure itself is often left out. Well, I graduated from my university’s Faculty of Law, so I know that whatever Naruhodo’s doing, that’s not actually a real trial (laugh). Takumi: It’s a bit of a mess there, isn’t it? (laugh). Arisugawa: But it would be more fun with such trials. Takumi: It would. When I first set-up the project of making a game that was like a mystery novel, I had to think about I’d make a game mechanic out of the process of having the players themselves solve the mystery, and that’s when I arrived at the idea of having the culprit claim something, and the player presenting evidence against that. And naturally, I couldn’t have the player input the names of every piece of evidence themselves, so they became basically items… And I thought that fitted good with the courtroom setting. I think the reason why such a game hadn’t been made until then was because there weren’t any people among the other game creators who truly understood what makes mystery fiction fun. If you had been a game creator, you’d probably have come up with it right away. Arisugawa: No way…. But having the detective protagonist in a mystery story play the straight man and comment on the culprit or witnesses does work well, I think. I wouldn’t be able to comment that much on the characters (laugh). So when I played the game myself, I thought by myself that this too was an interesting style to enjoy mystery fiction. Interviewer: I’d like to ask about something else. What do you pay attention to when creating a story? Takumi: There are now many mystery manga out there, like The Young Kindaichi Case Files, but they are always about serial killings, right? Gyakuten Saiban was made around the same period, so I wanted to make a story that wasn’t about serial killings, just to see if that could work. You need tricks for every murder that happens, so some might claim I was just worried I’d run out of ideas.... (laugh). So when working on the scenario, I’d plan out detailed plot twists, or shorten plot points in order to keep serial murders out of the picture. Arisugawa: There are a lot of mystery writers who have personal rules they don’t break. I’m not too fuzzy about that though (laugh). What I thought impressive about this was how it took the form of what would be interlinked short story collection if we’re talking about books. Each of the episodes are standing on their own at first sight, but then a large case shows itself to the readers at the end, and when that is solved, several plotlines all converge at that one point. A structure like that. There are a lot of fans of mystery fiction who love these interlinked short stories, and you can also find that fun in Gyakuten Saiban. Solving each case is amusing on its own, but in the final story you’ll realize there’s been a bigger story hiding behind it all. Arisugawa: And it was decided with just that one comment? Takumi: Yes. It was more-or-less an order (laugh). Arisugawa: I’d have protested (laugh). Takumi: At first I too laughed it off as a joke, but then I happened to come with an idea that would work as a linked collection. Interviewer: I’ll ask about the characters now. There are a lot of unique characters appearing in Gyakuten Saiban. Who do you like best? Arisugawa: The protagonist Naruhodo (Phoenix Wright). I like his name for one. What’s important about mystery fiction is to have the reader think: “I see.” (TN: Naruhodo means "I see" in Japanese) You know how there are also people who think that mystery fiction is about surprising the reader? But a mystery writer doesn’t only need to surprise the reader with something big: at the same time they need to convince, and satisfy the reader. That’s where the mystery writer needs to prove their worth. Both fiction and non-fiction hold their share of surprises, but the unique “surprise” of mystery fiction is that it also needs to make sense. What I want to write, is something that has you cry out “Oh!” and “I see!” at the same time. Takumi: I see! I had never thought about that! Perhaps I’m just too simple? Arisugawa: Perhaps you have a natural sense for it? (laugh). Takumi: In a way, the thing I pay most attention to is clewing and foreshadowing. Arisugawa: I am the same. I always think about the clewing when writing. That’s why mystery fiction is better enjoyed when read twice. You can then pay attention to the clewing. Takumi: Yes. I’d like people to play the games twice too. Interviewer: Let me ask Mr. Takumi now. Could you tell us which character you like best from Mr. Arisugawa’s works? Takumi: That’s a hard one…. I think I’ll go with the team of the detective Himura and Alice. I like the way the two bicker and talk. But I also like the conversations with Egami from the Student Alice series. That reminds me, I think I heard that you don’t like Himura? Arisugawa: I like writing him, but I wouldn’t get along with him in real life (laugh). As you know, Himura is a criminologist who cooperates with police investigations. It’s the perfect setting (laugh). I love series with great detectives, so I always try to write stories with them. So when creating a series detective you intend to use for a long time, it’s important to make it so they can be used in all kinds of situations. Things like their hairdo or personality are just to give it some more flavor. Alice on the other hand is the Watson. In my mind, the detective character only works because we see them through the Watson, so I needed one too. Also, the Watson = narrator = I. The actual author of the story was me, Arisugawa Alice, so that’s why I gave the narrating character the name Alice. Takumi: I also try to give Naruhodō as little of a background as possible in my games. The protagonist shouldn’t stand out. Arisugawa: I too don’t write too much about the narrator, the writer Alice. It’s written from the first person perspective, so naturally he wouldn’t talk too much about him anyway….. The fictional Alice likes in Ōsaka, and about 34 years old. He was first an office worker and then became a writer. I haven’t even written about where his parents are now. Perhaps they’re living right next to him in the apartment building (laugh). Anyway, I doubt I will write about them now, and I think that’s not a problem at all. Takumi: Many detectives have a mysterious background. Himura and Columbo are similar in that sense. I also think there are some things the creator should never write about. Some things are simply not fun if the creator decides on them. Some background to the rival or partner is fine though. Arisugawa: Himura was born in Hokkaidō and then moved around Japan…. And then something happened. I haven’t explained how his life went in detail. I wouldn’t know where to stop once I’d start with it. Interviewer: But the readers want to know why Himura says he wants to murder someone. Arisugawa: Though question. Even his creator doesn’t know all the details yet (laugh). Takumi: It’s just not fun if you reveal everything behind a character. What if Naruhodō came from Fukuoka… haha. But I have to admit, if I run out of story ideas, I might kill off Naruhodō’s father (laugh). Arisugawa: A detective solves mysteries, so their own mysteries shouldn’t be revealed. A detective should have a mysterious side to them, one they won’t allow anyone to solve. Takumi: Now you mention solving mysteries, how do you create your stories… Sorry I’m suddenly asking you questions like a fan (laugh). Arisugawa: I always start with the trick. If I’d start with the story, I wouldn’t get one single letter on paper (laugh). In my case, I first think of a trick, and then work myself back in time. How was this crime scene created, how would someone claim to have an alibi. Once I have that, I start to think about the profiles of each of the characters in detail. Once I have that, I start to think for reasons for the characters to be at the crime scene. For example, I might need an old woman, a young man and three women, because I need them for my solution. Something like that. Takumi: I started with the tricks too with the first game. But from the second game on, I couldn’t come up with tricks, so I started with the cases first. Arisugawa: Perhaps you felt you had to use the characters to their fullest? Takumi: I actually tried to keep it down. Trying to place the emphasis on the characters instead of the plot felt like in a way as fleeing to me. Arisugawa: But I think the fans do like the characters a lot. Takumi: That’s correct. I was convinced I focused more on the mystery plot, but the characters became much more popular… (laugh). Arisugawa: What I pay attention to besides tricks is that when I’m writing a short story collection, I keep the settings varied, for example by changing the season. Arisugawa: But of course, something you just come up with another story that works in the winter (laugh). The Student Alice series has many stories set in the summer, while the Himura stories were mostly set around winter at first. Also, the detective of the Student Alice series, Egami is a character who just happens to get caught up in some case, so I need to think of stories that fit that setting. Himura is a criminologist who fights crime, so he can poke his head in any case. Interviewer: Several of your works have been adapted for the screen. Have you ever thought of getting them adapted as a game? Arisugawa: Hmmm. I can come up with ideas for a film, but I can’t even imagine how to write a story for a game… I guess the biggest limitation for a game scenario is text length. I have to say I’m impressed how the text of Gyakuten Saiban always fits nicely on that small screen. Though perhaps you could’ve come up with even funnier wording or lines if you didn’t had the word limit. Takumi: I actually pay attention at where I break lines off , so the text boxes are easier to read for the players. Arisugawa: Few players will probably pick that out as something they liked about the game, but I bet that unconsciously, it really helps in their enjoyment of the game. Oh yes, it’s great you get to add music to a game. You don’t have that with novels. Takumi: Yes. There’s a big difference in enjoyment to playing the game with the sound off, or hearing a voice cry out “Objection!”. By the way, I did the voice of Naruhodō. Arisugawa: Eh? Really? Sounds like a fun role. Takumi: I just did whatever seemed like fun (laugh). The first game was made with an extremely small number of people, just seven of us. Games nowadays are made with about fifty people, but it’s difficult getting something of all those fifty people in the final product. But with only seven people working on a game, you can always sense the unique qualities of everyone involved, whether it’s the music or the art. So it feels like each single part of Gyakuten Saiban has a clear author behind it. Arisugawa: How long does it take to create one game. Takumi: The first game didn’t take very long, about ten months…. The second game took one year, and the third game one year and four months. Strangely enough it took longer and longer each time. Arisugawa: And the seven of you can’t get started on their work at the same time, right? Takumi: Precisely. If the scenario isn’t finished yet, the graphics can’t be made either, of course. But with a game, the number of people involved can increase slowly, but a novel is written all by one single person, right? That must be difficult. Arisugawa: In a way the job of a writer hasn’t changed at all since the Heian period. One person writing everything. Writing a text and then reading it. It’s so simple, but has lasted for over 1000 years. It’s pretty amazing actually. Takumi: What about it. Are you interested in writing a scenario for Gyakuten Saiban? Arisugawa: If you want me to come up with that many ideas, I’d need to go live alone in the mountains for five years to concentrate (laugh). Takumi: I think that I wouldn’t be able to write a novel either though. I can only write something like Gyakuten Saiban. Arisugawa: But you have written novels before, right? Arisugawa: You haven’t? No way, you have written some, right? (laugh). Takumi: I was enrolled in the Faculty of Literature in university, so I have handed in stories as part of assignments. I even wrote mystery stories even though I was told not to. But now I’m used to writing game scenarios, so novels might be a bit too difficult now….. I even find writing in the third person hard now. Arisugawa: Novels are a bit strange, if you think about it. “He was….” is a line you’ll often see in third person narration, but who is the person saying that! (laugh). Takumi: Hahaha. It does raise questions, doesn’t it? Is that why you write in the first person? Arisugawa: Well, yes. In my case, the novels I wrote in the first person happened to grow out to be series, so I have written a lot of novels in the first person. The “I” point of view is convenient, and fair, and useful for certain situations. There is a rule in mystery fiction that says the third person narration should never tell a lie, but that changes when it’s narration from the first person perspective. Let’s say it’s established that “I don’t lie”, followed by “I think that AAA”. But if later it’s revealed that it was actually BBB, you can just say that the narrator made a mistake. And you can explain why the narrator thought it was AAA. But writing in the third person has its own conveniences. You can show various scenes. When using the first person, it’s difficult showing scenes where the narrator isn’t supposed to be. The narrator can’t report on things that happen in places they weren’t present at. Takumi: Gyakuten Saiban is mostly first person, but occasionally uses the third person. Arisugawa: Like in the openings of each episode. Takumi: Yes. It feels a bit special if you occasionally break up the first person narration by introducing the third person. Arisugawa: How would this game have looked if it had been written in the third person from the start? The third person is often used in novels, so perhaps the text would have become more literary? 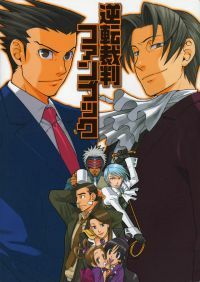 But Gyakuten Saiban as a novel…. It’s so packed with ideas, it’d become a very long book. Interviewer: Finally, could you tell us about what you thought about today? Takumi: At first the plan was to have me meet with a defense attorney and discuss the game with them. But I had no idea what I’d discuss with a defense attorney. So I then proposed I’d might have a talk with Mr. Arisugawa, and that came true, so I’m really happy. Arisugawa: I also enjoyed the conversation a lot. We both work on different mediums, games and novels, and also differ in age, but I can sense we both love mystery fiction. It’s because we share similar experiences as readers of mystery fiction, that this game also offers the fun that orthodox mystery fiction offers. Now I know why it was so fun to play (laugh). Interviewer: Thank you both very much. Could you please both sign these boards. They’ll be given away as presents to the readers. Takumi: I want one too! (laugh). Interviewer: Objection! You too will have to sign up separately for that.